Beatty High School’s attempts to grow a decent grass field for its baseball and football teams is a long story of spending and frustration. But last year’s installation of turf fields was a huge step for Hornet athletics. 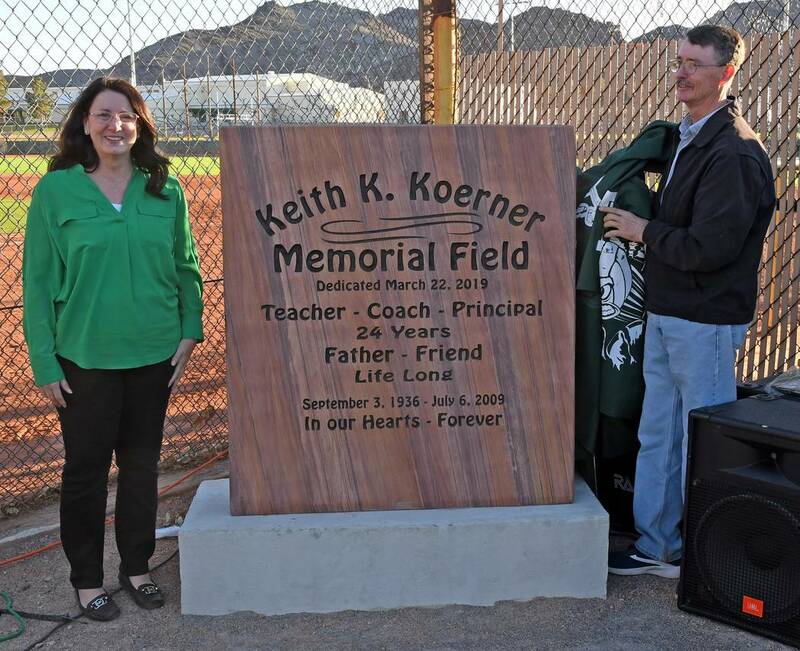 Richard Stephens/Special to the Pahrump Valley Times Kim Friel and Tim Koerner at the stone honoring their father at the dedication of Keith K. Koerner Memorial Field on Friday, March 29, in Beatty. 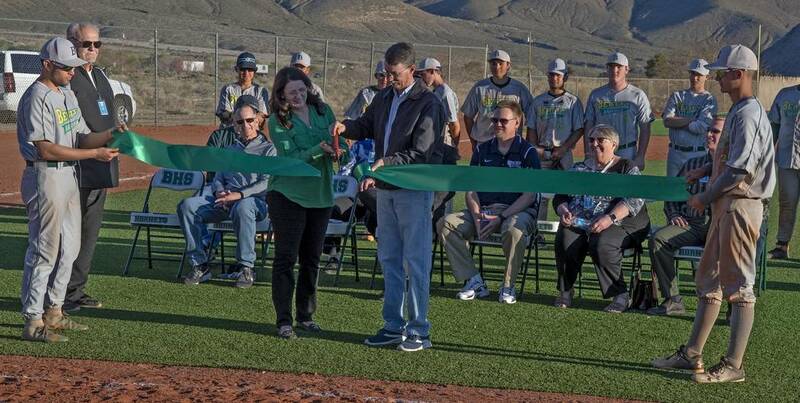 Richard Stephens/Special to the Pahrump Valley Times Beatty High School baseball players Geo Maldonado, left, and Jacob Henry hold a ceremonial ribbon at the dedication of Keith K. Koerner Memorial Field as two of Koerner's children, Kim Friel and Tim Koerner, do the cutting Friday, March 29, in Beatty. And Dale Norton, Nye County’s superintendent of schools, knew exactly to whom the new baseball field should be dedicated. 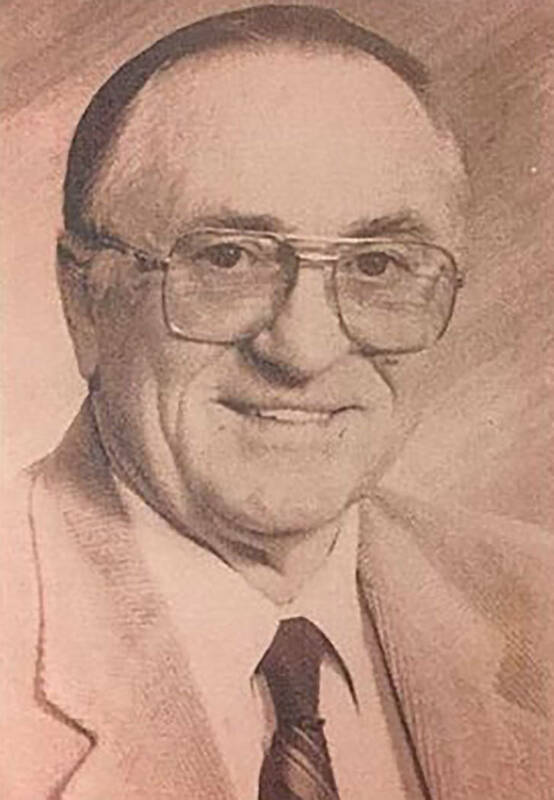 Koerner, who died in 2009, spent 24 years at Beatty High School as a teacher, coach, athletic director and principal. His daughter, Kim Friel, and his son, Tim Koerner, were on hand for the ceremony. A third son, James, flew out from Washington, D.C., a week earlier but was unable to attend the dedication when it had to be postponed because of weather. Keith Koerner’s son-in-law, Jim Friel, also spoke at the ceremony and shared an anecdote that summed up his father-in-law’s kids-first attitude. The Friels noted the irony of a new turf field on a spot where they spent hours trying to maintain the old field. But memories of Friel go beyond the time he spent working at Beatty High School. After the speeches, Beatty baseball players brought out a ceremonial ribbon for Kim Friel and Tim Koerner to cut, and the group then went off the field to a spot near the dugout for the unveiling of a stone marking Keith K. Koerner Memorial Field. A comment by Jim Friel perfectly summed up the spirit of the occasion.